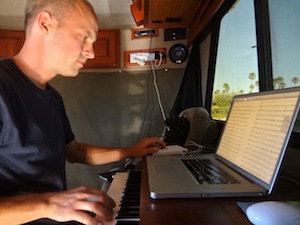 Glenn Morrissette is an orchestrator for Seth MacFarlane’s animated TV sitcom, “Family Guy.” He talked with MajoringInMusic.com about his role as an orchestrator and the joys of working from his home on wheels. What does an orchestrator actually do? You graduated with a BM in Studio Music & Jazz from the University of Miami. You’re a jazz sax player who composes and arranges –– how did you end up as an orchestrator? I moved to Los Angeles in hopes of getting into performing and writing for film and TV. Orchestrating is just one of the things I fell into doing. I think this highlights a key change that has occurred in the music business over the past couple of decades –– that with decreasing work opportunities, it’s getting harder and harder to steer one’s music career in any specific direction. As a result, a smarter approach is to be capable of doing a lot of different things, and then going with the opportunities that happen to come your way. What do you enjoy about orchestration? I’m very fortunate to work for Ron Jones on “Family Guy,” and not only because is he an incredibly skilled composer and all around great guy to work for, but also because we get to write for a full live orchestra for every episode –– exceedingly rare for a TV show. Another nice aspect of this work is that, because everything is done via email and the internet these days, I can do the work wherever I am and set my own hours. 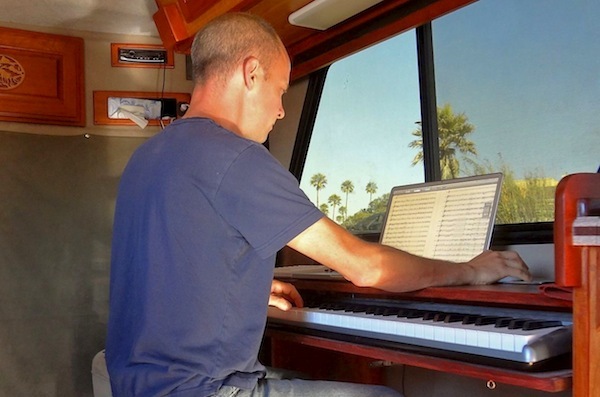 You do all your work in your home on wheels, with just a laptop, mic and keyboard? Yes. I strive to keep my setup as small as possible without sacrificing the quality of my work. A good set of ears is by far the most valuable piece of gear one can own, and nothing else can substitute for that. What’s your best advice to anyone wanting to become a working musician? Do it because you actually love doing it, and ideally because there is nothing else that interests you nearly as much. The music business is insanely crowded and competitive today, and if you get into it for superficial reasons (i.e., because you think being a musician is cool), it’s unlikely that this will be sufficient motivation to do all of the really difficult work that’s necessary to find success. Morrissette played on the 2013 Grammy award-winning Best Latin Jazz Album ¡RITMO! with the Clare Fischer Big Band along with musicians including Luis Conte, Peter Erskine, Steve Khan, and Alan Pasqua. Great layout and profile of Glenn. Would love to hear more- like what’s his favorite work from the show? What steps did he take in L.A. to meet Ron Jones? What else does he want to tackle in his career? Thanks for the profile- looks like a guy who is living the dream for sure! Just wanted to say thank you for a great piece on Glenn. I have enjoyed reading his blog for years, and I appreciate seeing a well-written article about him, his work and his lifestyle.